Standing on the beach and looking straight outward presents a vast and endless blue of ocean. Lying in the depths are ocean landforms similar to what we see on dry land. There are also some rather extreme landforms so fascinating they have been deemed famous sea landforms, which are known for their intense depths or perhaps first time discoveries. As one steps into the ocean and continues further, one will find the beginning of the continental shelf. This area is the extension that transitions from dry land to open sea at a distance of 330-660 feet then drops off at a point called the continental slope, which runs at approximately a 4-degree angle towards the ocean floor. At this point, where the continental slope ends and the ocean floor begins, is an area of deposits and material that accumulate by the way of deep ocean currents and mass wasting. This area is known as the continental rise. The entire area that is composed of the continental shelf, slope, and rise is known as the continental margin. Moving forward into the depths of the ocean floor is a regime known as the abyssal plain. This is basically the flat expanse of ocean floor and is found deep below the ocean surface anywhere from 10,000 to 20,000 feet. A notable famous sea landform in this area of the ocean is the Sohm plain, which is found in the north Atlantic. It expands a distance of an area of around 350,000 square miles. Most of the largest abyssal plains are found in the Atlantic Ocean. Further into the depths are areas of tectonic activity. Deeper into the Atlantic Ocean, is an area of mountain ranges that run north and south along the ocean floor. This area is known as the Atlantic mid-ocean ridge system or divergent plate boundary. This is where the ocean floor is born and in its infancy. Serious volcanic activity is rampant at this point, where magma wells up out of the depths of the Earth, spreads outward and then cools to form new ocean floor. Of course, motions of the ocean floor that are going in the opposite direction are occurring in places like the Pacific Ocean. Convergent plate boundaries are being forced together between continental and oceanic plates. Oceanic plates are of basaltic bedrock that is denser than the continental plate, thus driving the ocean floor back into the Earth from where it had come from originally. There is a third ocean boundary type. It’s known as the lateral plate boundary where oceanic plates run side-by-side in opposite directions. Ocean trenches lie in the depths where no human could survive exposures of hydrostatic pressure (up to around 16,000 pounds per square inch). These are the areas where subduction takes place at the convergent plate boundaries. The subduction zone is the area where the oceanic plate meets with the continental plate and sinks downward into the earth. This area forms a V-like structure that is considered a deep ocean trench. The deepest point in the ocean is at the Marianas Trench. It is a famous sea landform called the “Challenger Deep", named after the group of discovers' deep ocean submersible vessel named the “Challenger II". Ocean trenches generally are 3 times deeper than the ocean floor, yet surprisingly sea life still exist at those depths. Sea mounts are another type of ocean landform that are basically underwater mountains. They rise to at least 700 meters and usually form through volcanic processes. They usually exist solo, but some form mountain ranges as well. Sea mounts have been known to break the surface of the ocean, cease to be sea mounts, and then become a common dry landform–an island. Such a famous sea landform, off the Hawaii chain of islands is a sea mount that is about to break the surface of the water, has already been named Loihi. Of course, this future island won’t be seen entirely above the water’s surface for approximately 10,000 to 40,000 years. 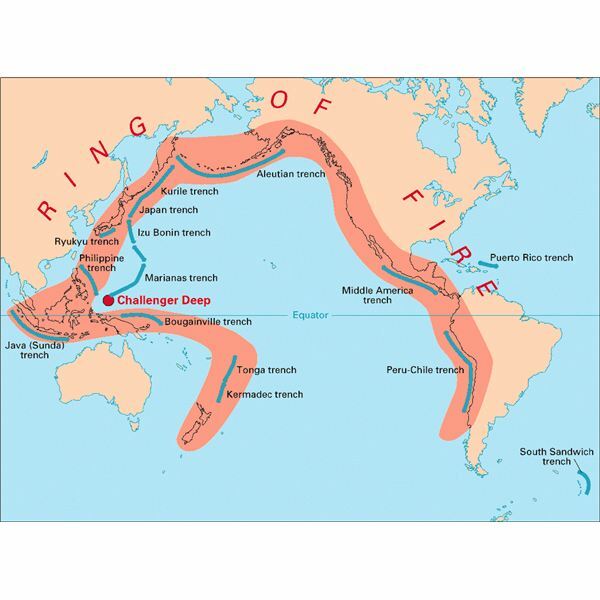 There is a region of volcanic and earthquake-related activity that circles the Pacific Ocean. This is known as the “Ring of Fire". In the Atlantic Ocean, tectonic plates are spreading outward, while in the Pacific, plates are converging together into one area. It will be no surprise that many years from now, all of Japan, the West coast of North America, and other coastal regions in the Pacific will all be bunched together as one landmass. It is no wonder ocean landforms are prominent due to such great activity. All these convergent plates that are being driven downward into the Earth, actually drive magma towards the surface of the ocean and on to the side of the continental landmass forming volcanoes and earthquakes.